After Saturday’s 3-1 defeat of Manchester City to Chelsea on Matchday 14 of the English Premiership League, Pep Guardiola will have one or two things to ponder and he will have several players looking to help him out in their UEFA Champion League match against Celtic. City are already through to the last 16 of the competition as runners-up in their group, meaning they cannot leap frog Barcelona into first place no matter what happens at the Etihad Stadium or elsewhere. Guardiola will need a replacement for Aguero, who is ruled out until December 31 through suspension. Iheanacho stood in for the Argentine earlier this season, scoring twice in three games, and looked right at home in the City attack. But things appear a little different now, given the Nigerian has not featured as much as expected in recent weeks. Guardiola insisted at the start of the season that he would rotate Aguero in and out of the team in a bid to keep him injury free, but that has not really been the case. Iheanacho has played just seven minutes in the Champions League this season – during that run when he filled in for Aguero in September, where he actually scored – and in the last five Premier League games he has played just 13 minutes. Even with Aguero now out of the picture for the next four domestic games, there is no certainty that Iheanacho will be first choice replacement, so a lot could ride on his performance against Celtic. And with Gabriel Jesus, the highly rated 19-year-old Brazil international, arriving in January, Iheanacho will have even more competition very soon. 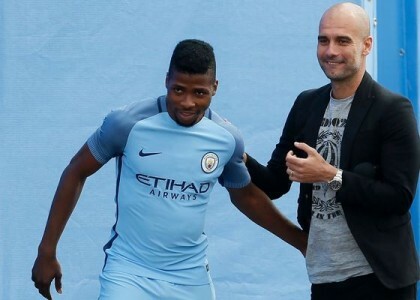 On 10 September 2016, Iheanacho started 2016/2017 EPL season in the Manchester Derby, he recorded an assist and his first goal of the season in the 2–1 win. Four days later, 14 September 2016, Iheanacho came off the bench to score the final goal in City’s 4–0 home win in the Champions League, against Borussia Mönchengladbach. This was his first European goal for Manchester City. Two days after the 4–0 win, Kelechi once again scored the second goal, also assisting the third, in City’s game against AFC Bournemouth. His goal against AFC Bournemouth took his goal tally in the Premier League to 10, allowing him to join an exclusive list of players to have scored 10 Premier League goals before the age of 20. This list includes world class talents such as Wayne Rooney, Ryan Giggs, Nicolas Anelka, Michael Owen and Romelu Lukaku.